Lucifer. Darth Vader. Voldemort. Gru. Literature is filled with heroes, but also memorable villains. And why not? The uncomfortable truth is that, for many of us, villains and evil are much more interesting than heroes and good. It’s easy to identify the hero—the good—in a narrative. Heroes are predictable and idealistic. Villainy, on the other hand, leads us to ask questions: Why? What next? Can evil tactics get more results than good ones? 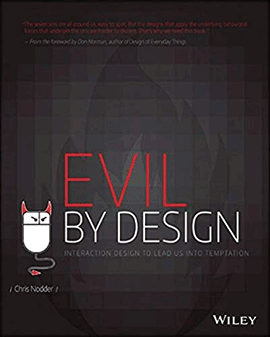 That line of thinking is what initially attracted me to Chris Nodder’s book Evil by Design: Interaction Design to Lead Us into Temptation. Throughout its 320 pages, the book examines the dark patterns and means of persuasion that have infiltrated our profession and culture. While good UX professionals advocate ease of use, obvious disclosures to customers, and increasing confidence on the part of users, seemingly evil UX professionals take advantage of the users’ shortcomings to short-circuit their judgment and enhance the all-important conversion rate. Evil UX design takes advantage of the user and prioritizes a Web site owner’s goals at the expense of the user’s, seeing ease of use as a fig leaf that conceals the real goal: conversion regardless of whether the user is an informed participant. What happens when we use the seven deadly sins—lust, gluttony, greed, sloth, wrath, envy, and pride—as a closed classification system for persuasive patterns in experience design? The most obvious outcome is that you get an interesting book title! Good UX design removes any difficulties that customers may have in converting, or undertaking activities that a Web site owner would like them to do. The goals of the user and experience owner are aligned. However, evil UX design takes advantage of the user and prioritizes a Web site owner’s goals at the expense of the user’s, seeing ease of use as a fig leaf that conceals the real goal: conversion regardless of whether the user is an informed participant. Rather than appealing to the user through the benefits of achieving a given outcome, the persuasive patterns this book presents appeal to weaknesses in the human character. The persuasive patterns this book presents appeal to weaknesses in the human character. Nodder’s method for presenting these patterns is helpful. He starts each section by describing the vice in question, provides examples of where it has been exploited, includes callouts that succinctly describe the pattern, and follows up with a how-to section, providing specific actions that a designer can take to develop a persuasive experience. The section on gluttony, for example, provides an overview of the vice, but also gives more insight into how to encourage gluttony. One sure-fire way is to make people feel entitled to a reward. You can do this by making customers put in some amount of effort to earn an exclusive reward. Nodder goes on to provide advice on how to present a reward, including what language to use and manipulating its perceived value. One of the joys of reading the book was finding out how these persuasive patterns permeate my daily life. 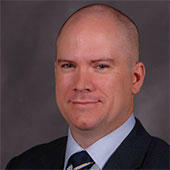 Gluttony in particular is identifiable in airline miles, video-game point systems, and pretty much any loyalty program. Not only does the book define user-interface patterns, it offers insights into how we could use these persuasive techniques more broadly—for example, in the creation of a business strategy. Dark patterns are tweaks that UX designers make to user interfaces in the hope of increasing some conversion metric over the short term. In recent years, UX designers have become aware of the intriguing phenomenon of dark patterns. Dark patterns are tweaks that UX designers make to user interfaces in the hope of increasing some conversion metric over the short term. They often take advantage of inattention on the part of the user. A common example is providing a check box for opting-in to email marketing at the end of a checkout process—in a position that is normally reserved for accepting terms and conditions. This is especially egregious when the dubious disclosure text appears in low-contrast gray. UX professionals … can design experiences that encourage behaviors that may not be in our users’ best interest. A common example is addictive user interfaces…. Many of you have likely noticed the recent trend in UX and design discussions around ethics. Naturally, there is concern that, as UX professionals who understand and design for human behavior, we can design experiences that encourage behaviors that may not be in our users’ best interest. A common example is addictive user interfaces—such as social-media network user interfaces with infinite scrolling, which encourage mindless, passive absorption of low-quality information. Or video platforms that automatically play the next video in a sequence, leading one to fritter away an entire afternoon—perhaps binging on the latest season of Arrested Development. Nodder’s book illustrates how we can design experiences in a way that removes a user’s agency. Rather than allowing users to complete their goals efficiently and go about their day, evil design results in experiences that encourage negative choices. In the case of video platforms, they remove all friction from taking the next action a company might want us to take. What is an appropriate amount of persuasion in a design and at what point are we harming customers? This is a difficult line for UX designers to navigate. Of course, the book also includes cautionary stories about companies’ unscrupulously applying the dark side of UX design. As a user, you have certainly encountered negative options if you’ve ever bought a subscription or made travel bookings online. Nodder refers to subscription services such as Book of the Month Club, Scholastic, and others who use advance consent marketing—another term for negative options—to increase sales. In these cases, a company provides goods or services at a low price up front, enrolls the customer in a program wherein he agrees to purchase the next book at full price—unless he mails in a postcard or takes some other action to prevent the purchase. Scholastic was fined $710,000 when they automatically enrolled customers in a second club when they joined the first club. Ultimately, if your method of generating revenue relies on taking advantage of people’s inattention or other impairment, you should consider what kind of business you are really in. The only criticism I have of the book: the classification scheme feels forced. While I think the content and tactics are very useful, the categories aren’t always clearly descriptive of the phenomena Nodder is presenting. But could we use evil for good? Maybe. Nodder presents the example of a light switch that displays an annoying visual pattern when the switch is on—leading a person to turn the switch to its off position—then presenting a more pleasing visual pattern. This is the familiar gestalt approach, in which a person completes a set or a picture mentally. As Nodder describes it, this is “pandering to people’s desire for order.” Interestingly, he included this example in the section on pride. This gets to the only criticism I have of the book: the classification scheme feels forced. While I think the content and tactics are very useful, the categories aren’t always clearly descriptive of the phenomena Nodder is presenting. [This book] is about discrete tactics that encourage users to take an action that is desirable to the owner of the experience. This isn’t really a book about evil. It’s about discrete tactics that encourage users to take an action that is desirable to the owner of the experience. While they aren’t good or bad in themselves, their application might be. As a UX professional and educator, I wholeheartedly believe that we should always advocate on behalf of our users. Who else will? We need to ensure that designed experiences and conversions—when desirable to users—are easy and frictionless. As the designers of experiences, our understanding of people gives us tremendous power to design user interfaces that are not just easy to use, but encourage particular behaviors. Nevertheless, if persuasion is a part of selling—and user experience is a critical part of a firm’s sales process—or encourages positive dividends for society, these are good things in my mind. Ultimately, it’s up to individual UX professionals to rely on their values in determining how they’ll use their talents—for good or evil. Request for Suggestions—I need more books to review! Do you have a book you love—or hate? Have you recently published a book? I’d love to take a read. While I have a list of books to review in the hopper, I would appreciate your recommendations. Please send your suggestions to: [email protected].